With the rise in SVOD (subscription-video-on-demand) streaming services such as Netflix, Amazon Prime, and Hulu, the internet has become increasingly important in the way that consumers now watch television. But is online TV killing traditional TV? Check out this infographic with statistics on how people in the United States and the United Kingdom are consuming their shows and movies. Now that the smaller and outrageously low-priced Echo Dot is hitting the market it’s becoming harder to resist trying what many consider to be the most convenient piece of tech they’ve bought in years. Most Echos end up in the kitchen (where hands-free timer setting and DJing tend to be the most helpful), but we’ve been wondering about its potential in the conference room. We put one in ours and here is where it shined. Utilizing one type of interface to control your home is not always ideal. You may want a handheld, tactile remote to enjoy your video experience in the living room, a touch screen with a large display in the kitchen to browse and play music throughout the home, a keypad next to the garage door that allows you to shut the entire house down with one touch as you head out, and a smartphone or a watch on your wrist to offer insight to what is going on at home while you’re away. Stop for a moment and think about the number of devices in and around your house that rely on your home network. Ten years ago, this might have amounted to no more than a laptop, a desktop or two, and maybe a DVR. Today, your network is likely congested with tablets, TVs, media streamers, music systems, multiple smartphones—including those of your frequent guests—and maybe even a few appliances. And that’s not even considering the fact that the home network forms the foundation for any home automation system. The tiny house phenomenon is on fire, with many homeowners choosing to downsize to live a life of simplicity. While this type of living isn’t for everyone, there are certainly aspects of compact living that are quite desirable. ​Do you love gaming but feel like something is missing? With these five home automation tips, you can boost the mood of your gaming session and take it to the next level. A dark space, high definition crystal clear clarity, ear popping surround sound, and the smell of buttery popcorn. Going to the cinema holds a great appeal for many, but what with long lines, crowded malls, and exorbitant prices for tickets and concessions, that appeal can quickly wane. Luckily there’s a new frontier in cinema currently taking place which eradicates these issues. The home theater includes all of the immersive advantages of a traditional cinema but at your own convenience, control, and customization. #C4Anywhere: Show us where YOU control your smart home! Last year, we saw a dramatic rise in smart home reports and surveys popping up everywhere. As a manufacturer with over 180,000 smart home systems in the field, we receive a ton of great information from our customers when we issue our customer surveys. Our own feedback shows that homeowners desire personalized experiences in the home with regard to entertainment, comfort, security and more. In fact, we estimate that 60 percent of them want their homes to react according to their predetermined preferences, just as they walk through the door. For the second year in a row, the CE Pro 100 Brand Analysis determined Control4 as the brand leader for the whole-house automation and control category and was named top brand in additional categories. See more, with a link to the full CE Pro report. Would you like to make your kitchen futuristic without having to break the bank or spend months waiting for your home to be renovated? That’s now very easy to achieve in the modern era of smart kitchen technology, where fridges can tell you what’s inside and for how long each item has been there, or cookers that can interact with your smartphone to tell you when your meal is ready to be served. This infographic by Pennywell (www.pennywell.ie) takes a look at the impact of smart kitchen appliances, giving you a peek into an exciting future. Working from home has its luxuries, including a flexible schedule, no dress code, and the lack of office environment stress. But that doesn’t mean it’s an all-day movie marathon pajama party. You have important tasks to accomplish that require tuning out numerous distractions, and you must tackle menial side-tasks without getting derailed. When you’re physically uncomfortable or worried about activities going on outside of your office, a whole day’s worth of productivity can fly out the window. Today we announced the acquisition of Pakedge, a leader in advanced home networking products and cloud network-management capabilities for both wireless and wired networking solutions. Pakedge brings to Control4 deep networking expertise and an industry-leading suite of networking, power management, and remote monitoring products, along with advanced software capabilities unlike any others on the market today. Their founders, senior management, and product organization are joining the Control4 team and we are enthusiastic about all we can do together for the future of the smart home. A Smart Home for Every Home. PRODUCT LAUNCH ANNOUNCEMENT: WATCH IT HERE! We are excited about the new year, and even more excited to share some big news with you. Join us for the online event on Tuesday, January 26 at 10:00 a.m. MST, 12:00 p.m. EST to watch it live! We are pretty excited to have been hand-picked by Houzz for an editorial ideabook feature titled, "Designing With the Stars: Aquarius." In the article, the author, Kate Macdessi, notes that people with the Aquarius sign are drawn to technology. In fact, they tend to be the most tech-savvy of the zodiac bunch. Are you an Aquarius sign? If so, do you agree that your sign is the tech-savviest of them all? We'd love to hear from you. Every January marks yet another year of the biggest Consumer Electronics show in the world: CES in Las Vegas. 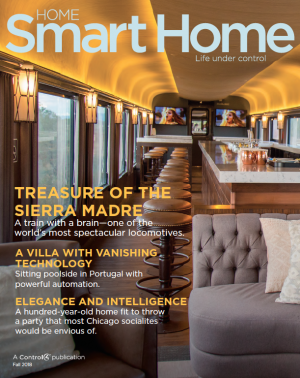 This week, we debuted a proof-of-concept to unite smart home functionality with connected cars; a topic that is proving to be a popular one this year. Keep Your House Dry, DAM-it! Every year nearly one million families have their homes ruined and their lives overturned by water damage and the subsequent repairs. These incidents are always unexpected and the cost of repairs can run into the tens of thousands of dollars. Even after the damage is repaired, you can still suffer from side effects—such as mold—that are invasive and hard to track down.